This should be a short review. Comedic gold. Send that home to your parents, compliments of the ol’ Darianster. 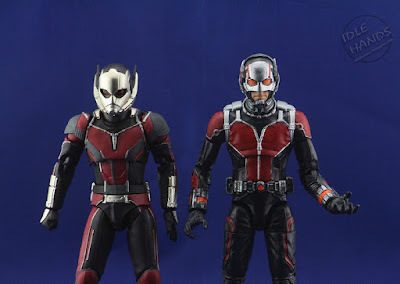 Today we’re taking a look at the brand spanking new S.H.Figuarts Ant-Man. 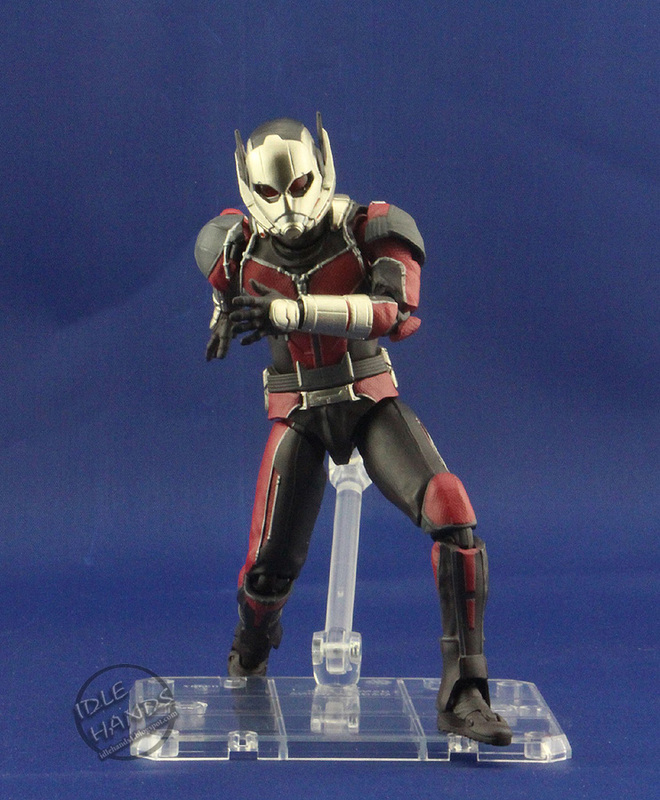 This isn’t my first Figuarts figure. I’m pretty much a sucker for any super hero/Star Wars license they release. 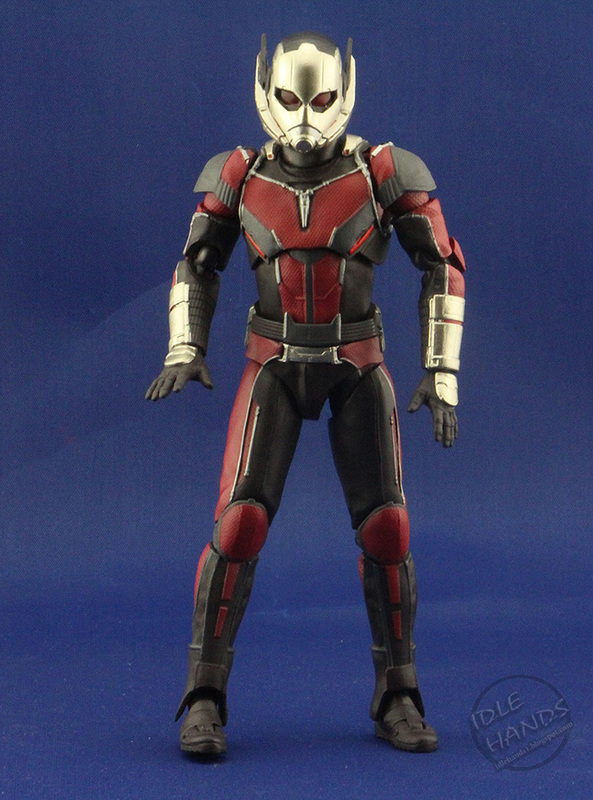 The figure is a 1:12 replication of Scott Lang in his second Marvel Cinematic Universe (MCU) uniform. 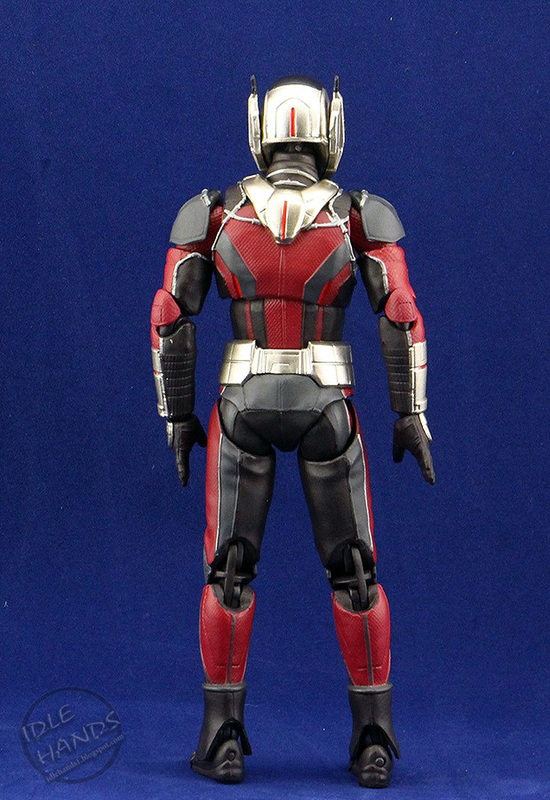 As expected, it’s a great figure. How great is it? With a company like Figuarts, we expect great things. 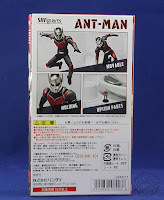 That’s why I wanted to place my Figuarts Ultron firmly in the toilet and hate-flush him out of my sight. In Ant-Man, everything we’ve come to expect is there, from a dead on representation of the character to tiny extras (see? Another short joke… I have them for days, people, DAYS!). 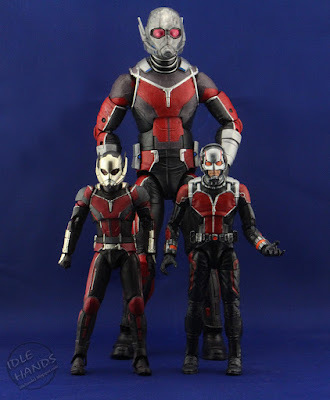 As you can see in the pictures, it’s slightly shorter than the Marvel Legends Ant-Man from his solo movie. On a character that manipulates his size, that’s an easy sell in my 9 year old baby brain to reconcile. 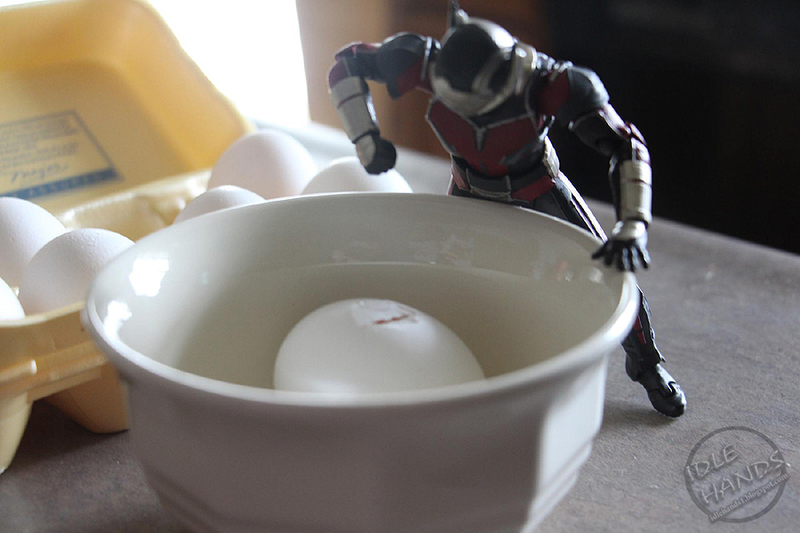 However, he doesn’t have the soft rubbery legs of his legends counterpart (which is a good thing). 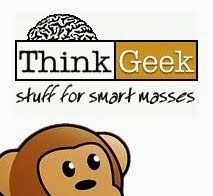 If you haven’t seen Civil War yet, and you want to avoid small spoilers (HA! Small!) you may want to circle back to this review. There are a few cosmetic difference between the initial uniform in his solo movie and the uniform in Civil War. Primarily the color of the helmet, gauntlets and knee pads. Not a positive or a negative, just a general observation. The figure captures those nuances. 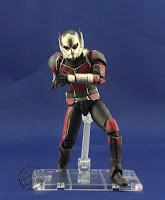 The articulation is pretty much what we all expect by now if you have ever purchased a Figuarts Marvel figure before. We have great range of motion in the neck/head area with head pivot. Shoulders, forearms, double jointed elbows, torso crunch and pivot, waist and hips, double jointed knees and feet with smooth up down movement and some pivot to sweeten the deal. The wrists, however, don’t seem to have a lot of give to them in terms of movement. Finally, we land at the accessories. This is where my biggest gripe for this figure lands. 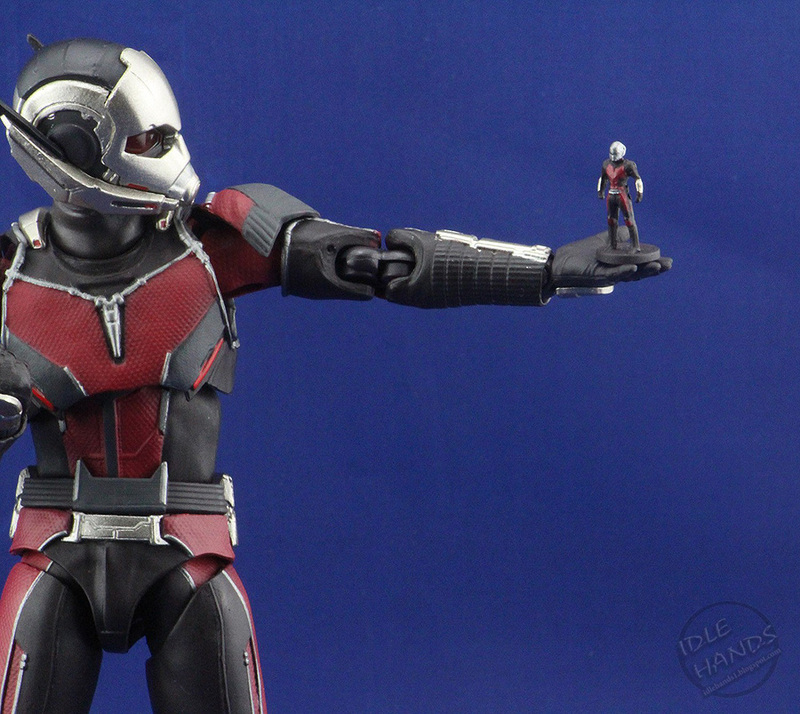 He comes with an insanely accurate teeny tiny version of himself. 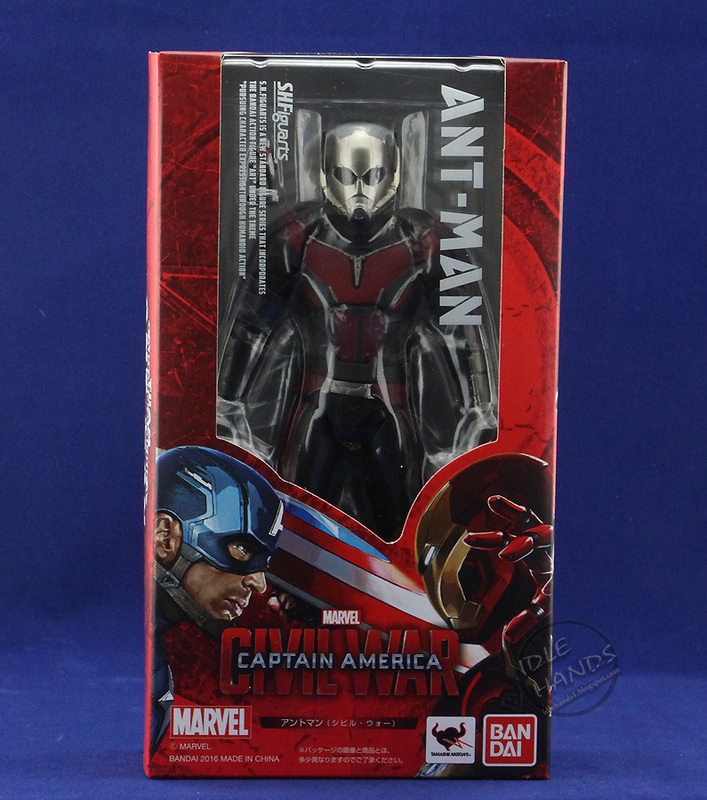 Tiny, as in, “can stand on Cap’s shoulder and look great” tiny. Then he has an extra set of relaxed hands. That’s it. I’m not sure what else to call those hands. Ant calling hands? 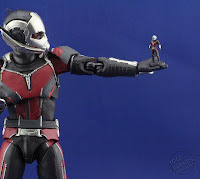 “Here ant, ant, ant…” If you’ve seen the movie, you know the worst kept secret in all of the MCU is that Scott Lang gets rather large. 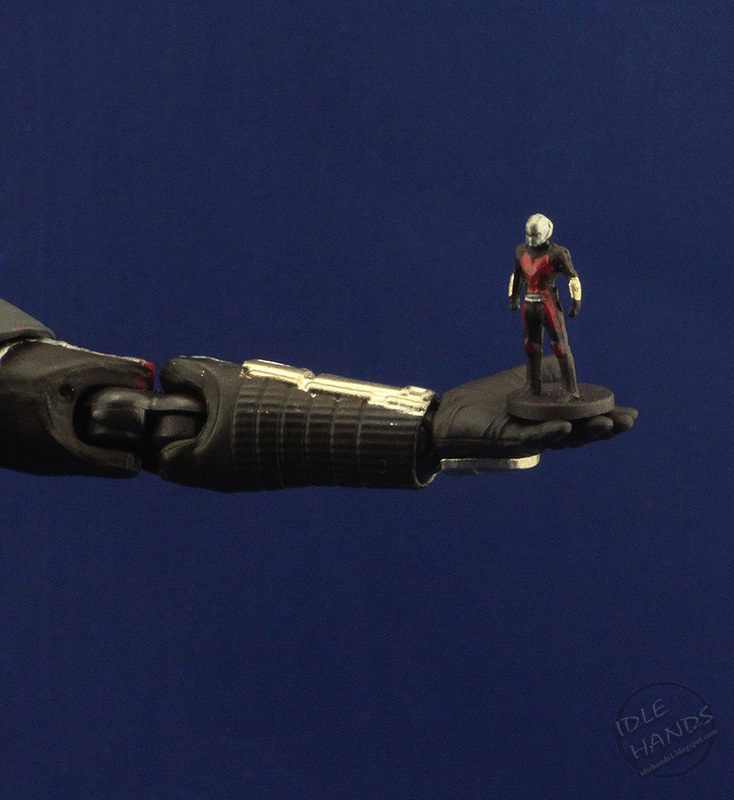 Not the kind of large from standing too close to Scar-Jo, but Giant-Man large. They never come out and call him that, but you bet your sweet nerd hiney that’s who he is in my world. 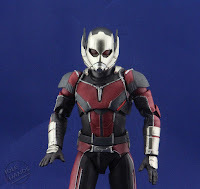 Point being, the Marvel Legend BAF Giant-Man had translucent lenses on his helmet, allowing us to see Scott’s eyes. 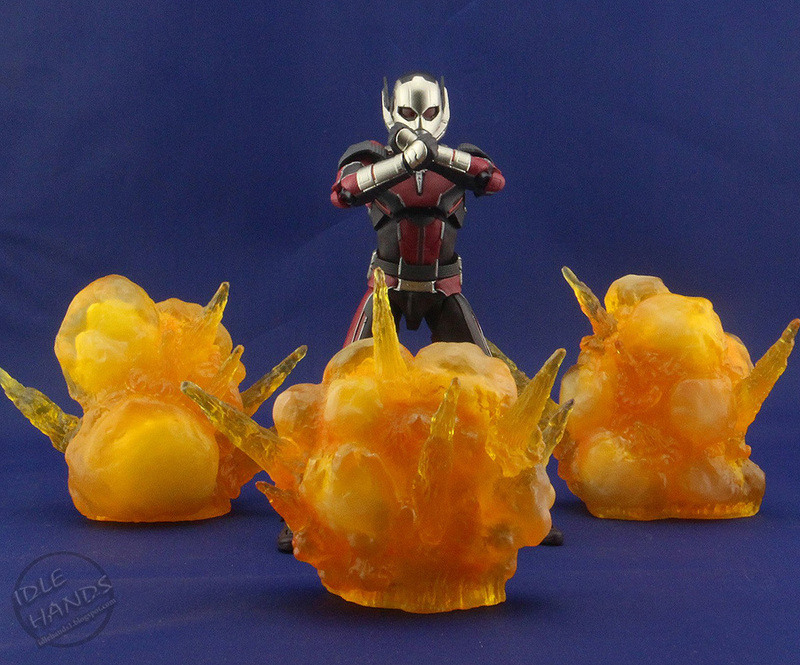 I’m not sure why Bandai didn’t opt for that, but it would have been a nice touch. I can’t get too upset about the limited accessories. 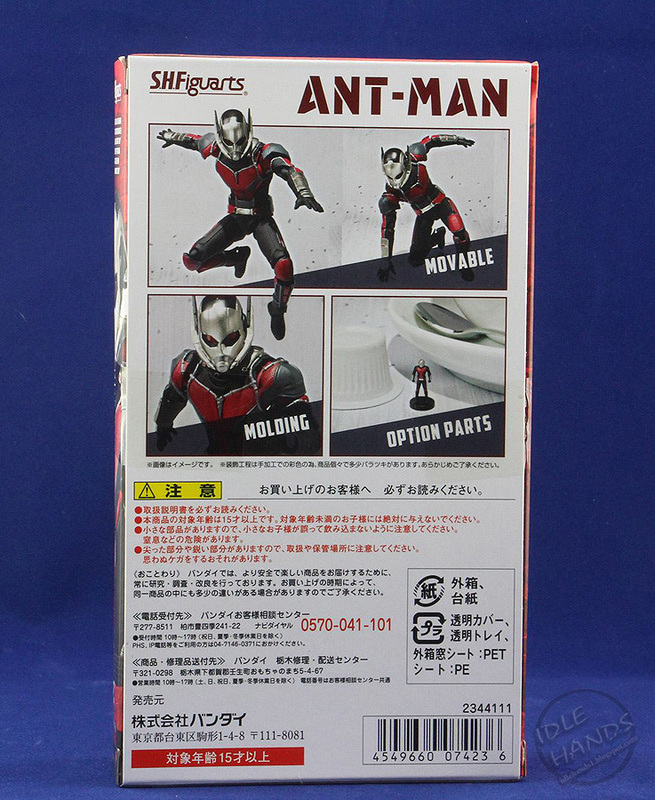 What do you package with Ant-Man? I guess possibly a swarm of ants, but parents across the world would frown on that. I can forgive the aforementioned lenses, because I am not super picky. No, my biggest gripe would be the price point. 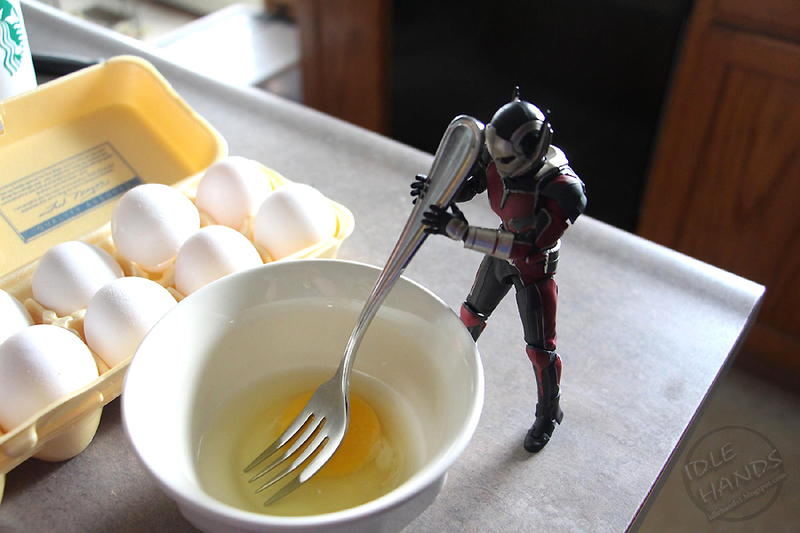 I paid as much for Iron Man and Cap as I did Ant-man. 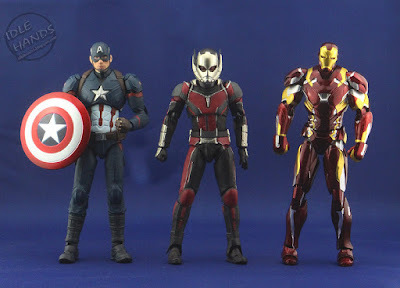 The first two come with at LEAST three sets of different hands, special effects, an extra, unmasked head on Cap and other goodies. I understand prices vary with imports but on the same token, how are these figures even close in terms of value? 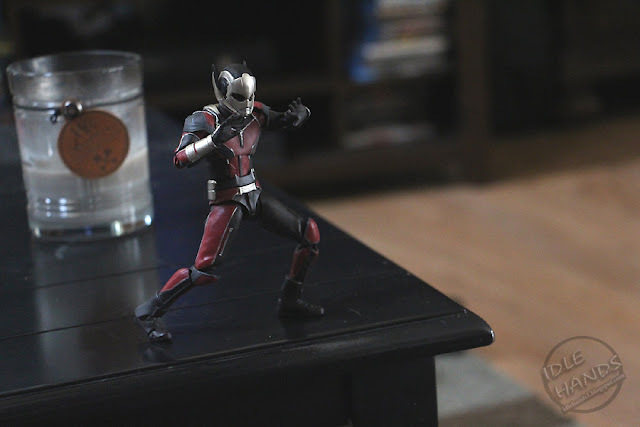 Ultimately, I’m glad I have Ant-Man and I welcome him to my Figuarts MCU collection. That being said, there are only a few reasons why one would need him. Reason 1: You want to keep your Figuarts line complete. Reason 2: He’s your favorite character. 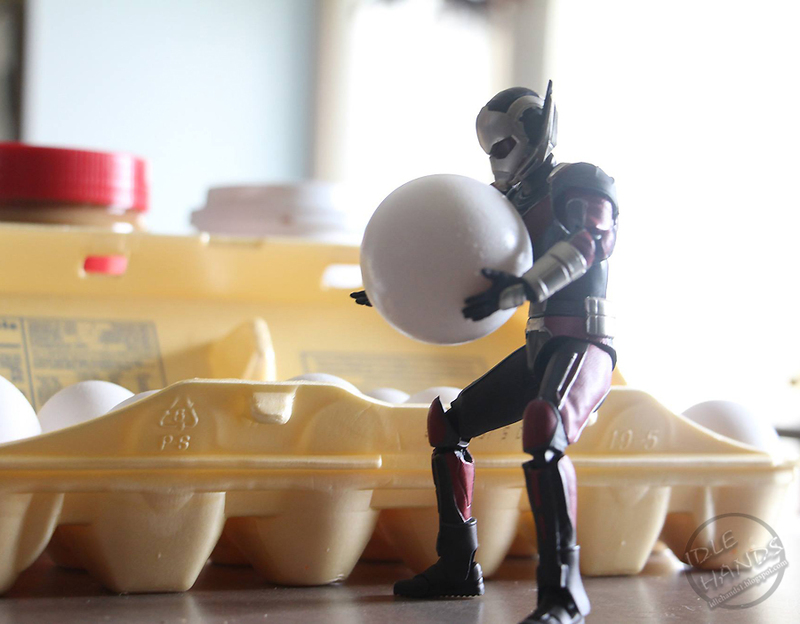 Reason 4: You want a fun figure. He’s just a fun figure to tool around with in different poses. 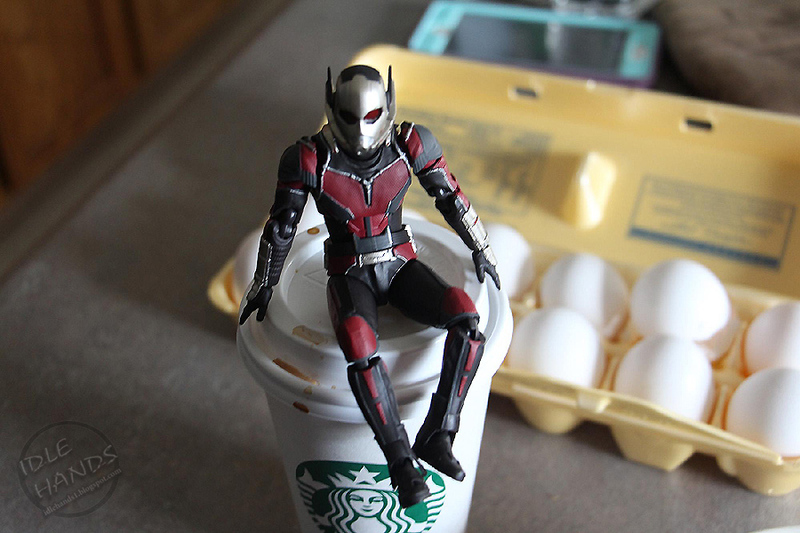 The nice thing about a character that could possibly be the same size in real life is the play value of setting him next to normal objects. The more I posed him, the more fun he was for me. 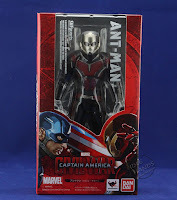 He’s a great figure and if you can get him at a decent discount, grab him. Otherwise, based on price point, if you don’t fall into the four reasons listed above, maybe save your money. 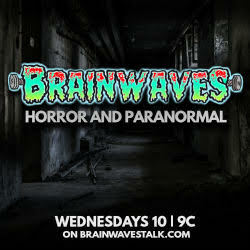 Feel free to comment so we can discuss! Yes... yes, it was a Friends joke. I would feel dirty, but since I have no dignity, I don't know how.